ConceptDraw MINDMAP with the new Quality MindMap solution allows users to depict a quality processes or the company. With a mind map everyone can easily describe a quality process using a tree structure as well as show process relations, use visual symbols to improve understanding, and produce presentations. You can use mind maps for completed quality process analysis, giving more visibility to the focal points that you need to get clear. Pic.1 Quality mindmap - TQM. 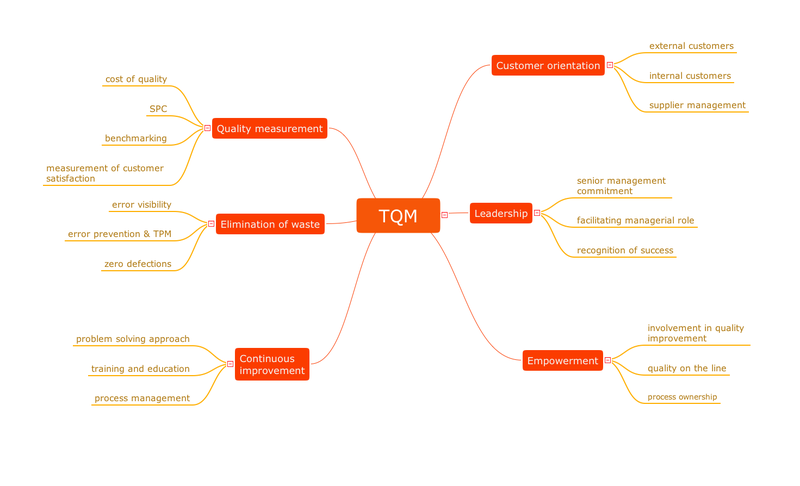 This mind map demonstrates how well-known Total Quality Management (TQM) methodology can be represented in a mind map. Using mind mapping for quality management is a creative approach that allows one to structure all key quality points on the one page. Using mind mapping for quality management is a creative approach that allows one to structure all key quality points on the one page. Quality Management Mind Maps - Presentations, Meeting Agendas, Problem will be solved. The visual form of mind maps is helpful in all stages of quality management, from describing problem to describing and documenting a decision. Sharing Documents Trough Skype: Share files, manage projects, inspire ideas, connect people.